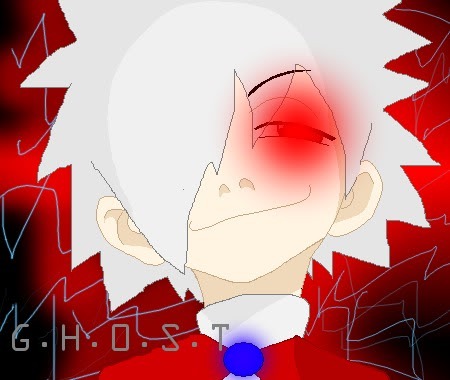 Physical Description: GH0ST appears to be a normal 13 year old boy with the exception of his snow white hair, pale skin, and red eyes. GH0ST is 5ft 1in tall and weighs a measly 85lbs but don't let his demeanor fool you GH0ST has super strength and can lift his foes by there throat inches from the ground. GH0ST always wears his favorite white sweater, a turtleneck sweater that goes past his waist, red cape, held onto his neck by a mysterious blue stone, black pants, and boots. Mental Description: GH0ST is super intellegent with an IQ of over 3000. He has also developed pshycic abilities along with his signature puls0r abilities which allow him to freeze an enemies, thrust them far away, or crush them entirely. Storyline: Genome Hybrid Zero Super Tyrant otherwise known as GH0ST was once a normal 13 year old boy until he was kidnapped and expieremented on by Dr. Roy Curien. Curien began a special program specifically for GH0ST making him the final edition to his Tyrant program. Curien implanted a large amount of his own memories into the boy causing him to suffer amnesia and constant headaches forcing him to forget who he once was entirely. After Roy's work was completed he hid away GH0ST in one of his many basements frozen in time in one of incubation chambers. 22 years after the Curien Mansion incident GH0ST was released as unsuspecting AMS agents returned there under the suspicion that Curien had hid away a powerful weapon. Suffering from extreme hunger after his long slumber GH0ST semi-conciously subdued and devoured the AMS agents. Once he came to, GH0ST vowed never to eat the flesh of humans again. Doing a bit of rummaging throughout Curien's lab GH0ST slowly gained Curien's memories, within an hour GH0ST knew everything he needed to know, and suddenly realized the meaning of his existence, to destroy and resurect the planet. GH0ST released the others of the Tyrant program including ZPink and a few other Super Tyrants planning to take over the world. The expierements performed on GH0ST cause him to sometimes lose touch with reality and go temporarily insane. On occasion GH0ST will suffer minor headaches where he will scream "Not Curien! Not Curien!". GH0ST can speak 5 languages but he prefers japanese. He may also pretend to be a normal boy to lure his enemies to there demise. The zombies seem to like GH0ST and will protect and follow his orders. GH0ST plans to take over the world and creat a new one in which he calls "One nation under the Dead" or simply "one nation" or in japanese as "Hitotsu no kuni". GH0ST walked toward his wounded enemy arms folded and a twisted smile on his face "So is this all you can do?" GH0ST taunted and began to snicker evily. "Well then I guess there just isn't any reason to prolong your suffering..." GH0ST rose an arm using his Puls0r abilities to lift the wounded agent into the air "Sete, kore wa anata no owaridearu" he said as he clenched his hand crushing the agent spilling his blood onto his red throne room carpet. "Let this be the end of you"